If you stood to one side and watched him, and thought about the story of his life, you had to believe that miracles were possible. Here was a man who survived three terms in Cambodian prison camps. A doctor who used his knowledge of nutrition to keep himself alive by eating beetles, termites and scorpi ons. A man who weighed only 50 pounds six years ago, when he crawled between Khmer Rouge and Vietnamese lines to safety in a Red Cross refugee camp, and who now was calmly signing autographs and giving interviews and having his makeup checked before he went on the air. The “AM” show was broadcast ing live from the plaza outside Chandler Pavilion. Haing Ngor walked onto the set to be interviewed by the co-hosts, Steve Ed wards and Cristina Ferrare. Ed Crane, the West Coast publicity manager for Warner Bros., stood behind the cameras and listened. In a town where casual is chic, Ngor was dressed this morning like a doctor. He was wearing a navy blue suit coat and vest, a striped tie, brown slacks. He held himself with a certain reserve; the extraordinary attention surrounding his perfor mance in “The Killing Fields” hasn’t turned him into a crowd pleaser. He is one of those natural noblemen who seem incapable of losing his dignity. After he got off the air, Ngor signed a few autographs, always taking the time to find out the fan’s name and write a little per sonal message, and then Ed Crane steered him into a big stretch lim ousine with a bar and a TV set. They were off to the Tuxedo Cen ter on Sunset Strip, to be outfitted for the big night. While Ngor was trying on tuxedo pants, Ed Crane was on the phone to the nearby Chateau Marmont Hotel, the Hollywood landmark where John Belushi died. “I need a nice, quiet suite for the GMA sit-down interview,” he explained. “I’m asking them to do me a favor and lend me one.” They did. “Tell about all your fan mail,” Crane said. Haing Ngor has been trying to balance this public fame with his full-time job at the Chinatown Counseling Service, an agency that advises newly arrived Southeast Asians on resettlement in America. “I try to find them job, find them place to live, tell them about welfare benefits,” he said. Have you had to take a leave of absence to deal with all the Oscar publicity? I asked. That has resulted in Ngor’s co-existing in two worlds. One is the Los Angeles Cambodian community of some 50,000 people, settled in the Long Beach area, where he lives. The other, 30 miles away by expressway, is the world of Hollywood back lots, luncheon in terviews, Beverly Hills cocktail parties and TV studios. On the Saturday before the Oscars, for example, Ngor attended three parties: One given by the managing editors of Time and People magazines, one given by the executives of Warner Bros., and one given by his friends in Long Beach. He borrowed a studio limousine to visit his friends in between the other two events. At the Chateau Marmont, ABC-TV reporter Cathy Lee Johnson was waiting for Ngor. The “GMA” cameras were set up in a big top floor suite overlooking Sunset Strip and a giant Marlboro Man billboard; Bogart and Bacall had once partied here. Johnson asked Ngor how it felt to be nominated for the Oscar. “I don’t understand what you mean, how it feels,” Ngor said. His English is fairly good, and he is quick at memorizing dialogue in English, but sometimes there is a context he doesn’t understand. “She means, how do you feel,” Crane said. “Nervous and exciting and happy and funny, too,” Ngor said. After the “GMA” interview, we went to have lunch at Chan Dara, a Siamese restaurant near Hollywood Boulevard. Here, surprisingly, Ngor was not quite so much of a star, and had to wait for a table. 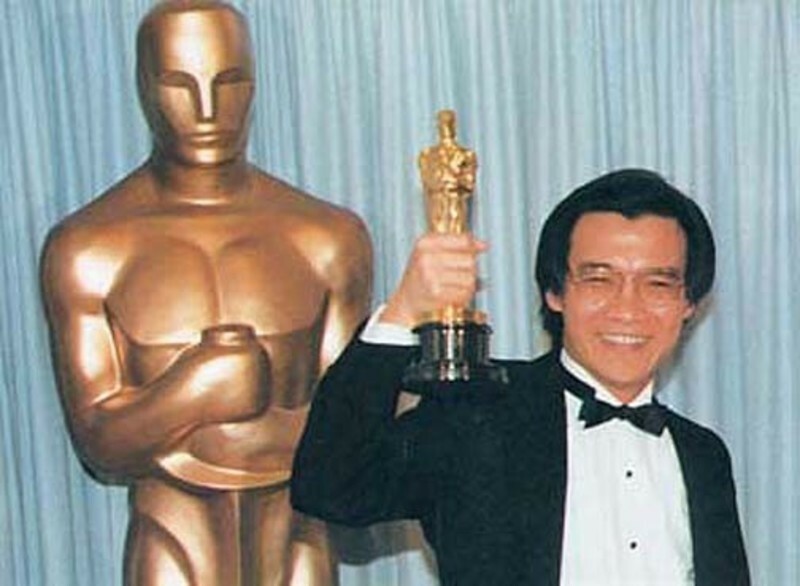 None of the Asian employees asked for his autograph, perhaps because they were not in the habit of seeing Hollywood movies, even the ones starring Cambodians. He supervised the orders for lunch, choosing beef with mint leaves in chili sauce, and a spicy soup. How does that feel? I asked Ngor. Are there times when it sud denly strikes you, how different your life is today than six or seven years ago? Do you someday hope to have children, to carry on the genera tions so that the Khmer Rouge will not have exterminated your family? “Yes, have children, so next gen eration can deal with my country.” Do you have a girlfriend now? The food arrived, and Ngor and Crane began talking about Ngor’s future acting career. There seem to be two approaches to the subject. Some movie industry people be lieve that Ngor is a (one-role phe nomenon, like Harold Russell, the handless veteran who won an Oscar in 1946 for “The Best Years of Our Lives.” Others, like his “Killing Fields” co-star John Malkovich, say that Ngor is a natural actor and can play anyone. Some people say you were only playing yourself in the movie, I said. The soup arrived, and Ngor took the ladle and served everyone at the table, insisting they take larger portions. “And now he’s bigger than Bruce Lee,” Ed Crane said. Haing Ngor laughed. This was better than eating scorpions.